The story of the discovery of the takahe, a close relative of the ubiquitous pukeko, is one of New Zealand’s conservation success stories. The bird, at one time relatively common in both main islands, was thought to be extinct for 50 years. A bird had been discovered near Te Anau in 1898, but no more were found until 1948 when a small party of ornithologists, led by G.B. Orbell, located the bird deep in the Murchison Ranges. Within a few years a small number of chicks were captured by a team led by Elwyn Welch of Mount Bruce. They are still rare in the wild. The tui is a member of a family of honey-eating birds found only in the south-west Pacific. The tui, with its dark colourings and white tuft under its throat, has been called the parson bird, but its ebullient nature defies its common name. In the wild its call is reminiscent of the related bellbird although it is more melodious and fluid. Both in the wild, and in captivity, the bird has a tendency to imitate other sounds, and a bird living in town may interrupt his long song with the sound of a cellular phone, or even a wolf whistle. Tui Street was named in 1955. 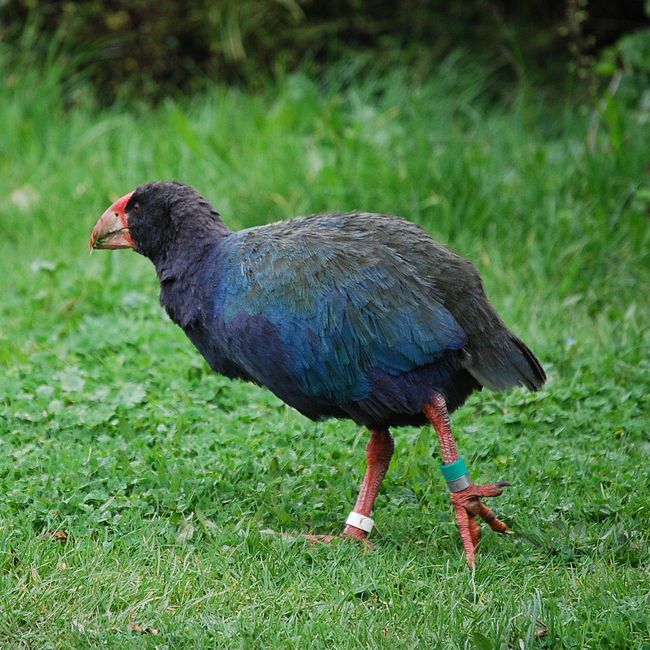 Pic: The takahe were first kept in captivity at Pukaha Mount Bruce.